In preparation for Light Up MillBridge, we are spotlighting one of our newest neighbors and holiday-decorating extraordinaire, Carissa Flint. 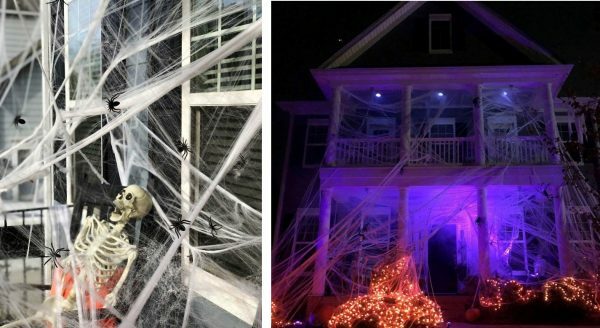 Carissa caught our eye when she covered her house in spiderwebs for Halloween (more on that inspiration below), so we just had to check in with her to see what she was up to for Christmas. What brought you to MillBridge and attracted you to the neighborhood? How long  have you lived here? Everything!!!! I originally fell in love with MillBridge last October when we officially decided to relocate from California. I cyberstalked the community on Instagram and knew just about everything there was to know about the area before we finally visited in June of this year. We were only in Waxhaw for two days to scout out some homes, but MillBridge was at the top of my list. When we finally got to drive through, the first thing that caught my eye was the bridge that I had fallen in love with from so many pictures. Second was the pool with the water slide and lazy river. It’s like living at a resort! It was a done deal after that. My mother Debi, myself, my daughter Kennedy, our goldendoodle Dodger, and our bunny Buttercup all made the BIG move in a U-Haul this past August. We have been here for almost three months now and wouldn’t go back to Cali if you paid us! What do you and your family like best about living in MillBridge? We absolutely love the community! Growing up and living in California, community was something that we craved! Having neighbors who aren’t strangers and who become close friends is priceless to us. We adore being able to drive down the street and have people young and old stop what they are doing to smile and wave at you. It almost doesn’t feel real! We comment all the time about how it feels like we live in a Hallmark movie. It is also incredibly beautiful here! There is so much to take in and see. We just discovered the walking trails and suspension bridge; it’s a new favorite spot for us with the fall change. What do you do outside of MillBridge? I have many little side jobs that I use to nurture my creative side.  For the past two years I have run a commercial plumbing company and worked on the investment side of commercial real estate. However, with our new move, I am considering a new career path and looking for a way to carve out my vision. I am going to be starting my own staging and event planning business per the advice of so many friends, family and neighbors. I followed my heart to North Carolina, I figured I should trust it now and follow it towards my passion of creative design as well. Tell us about your love of decorating for the holidays! I grew up in a home where both of my parents poured everything they had into making my childhood magical and amazing. They stepped it up even more when it came to the holidays. For me, when I had my daughter, my goal was the same. You are only a child once and kids loose that childhood wonder so quickly these days. I have found that the magic is in the details. The smallest thing can make the biggest impact. Through the years, I have found that my passion is fueled by the impact it has not only on my daughter, but on others as well. Hearing people’s reactions when they drive by our home and the kids “Oooo’s” and “Ahhh’s” makes it all worth it! If I have added even the smallest bit of magic to our neighborhood, I have done my job! How do you get your family and friends involved in holiday celebrations? Do they love to decorate too? My family loves to decorate as well, especially my mom, but not quite on the same scale as me. I go BIG with everything I do! I am a sucker for creating and carrying on traditions. Santa hats are a staple in our home during the month of December and at pretty much any holiday event we attend. Whether my family or friends like it or not, they will likely be wearing a Santa hat if they go anywhere with me. We love to entertain with home cooked meals, game nights or even just a cup of hot cocoa by the fireplace. That’s a loaded question for someone like me! There are so many it’s hard to choose. 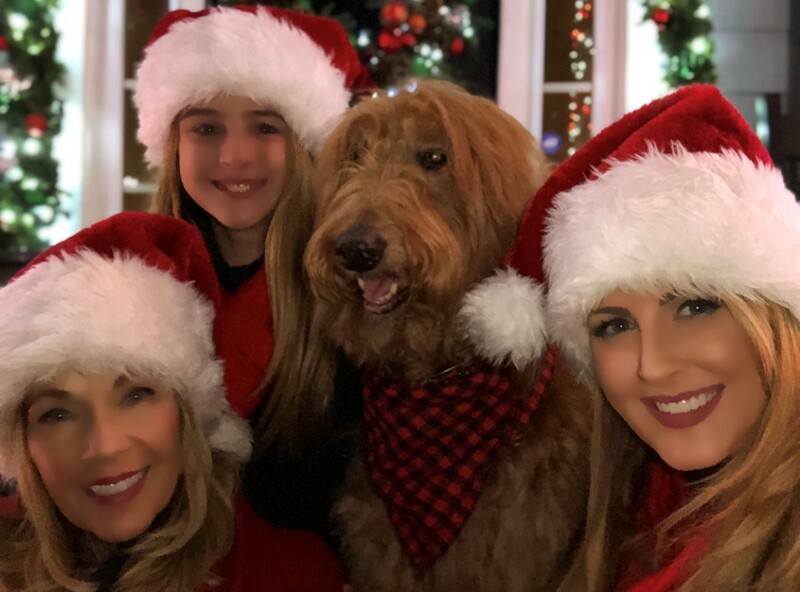 When we lived back in California, we would take our Christmas picture in front of the giant Christmas tree at Fashion Island and then head over to the Balboa Boat Parade (Santa hats on our heads) and watch the parade from the shores. Some of the traditions that followed us here to Waxhaw are decorating the tree as a family while listening to Nat King Cole, watching Christmas Vacation, A Christmas Story and Elf with the family, making Christmas cookies and decorating the house. My mom and I have a Christmas cookie company. I look forward to making cookies with her every December and delivering them to our clients. However, my absolute favorite holiday tradition is every Christmas Eve we open our Christmas pajamas, hop in the car and look at Christmas lights. I can’t wait to find new holiday traditions here! What are your plans to decorate for Christmas? I think that we have the next three years planned out with themes already! It’s hard not to when your home looks like it was built to be decorated. This year we are going with a “Candy Cane Winter Wonderland” theme. While my inner Griswold wants to go crazy with lights, I promise to keep it classy! We may need to give our neighbors some sunglasses though. I’m inspired by so many things. Often, as I have said before, it’s the little things that have the biggest impact. For me, this year, I saw a giant spider in our backyard and instantly pictured our home engulfed in spider webs for Halloween. When we moved in, I saw our columns on our patio and my mom and I immediately commented how perfect they would be as giant candy canes for Christmas. In everything that I do, I try to think how it will make others feel. I want to create a feeling of childhood wonderment and magic in people of all ages. I think to myself, “If I were driving through a neighborhood or going to an event, what would make me stop and say ‘WOW’?” Then I try to make that happen! 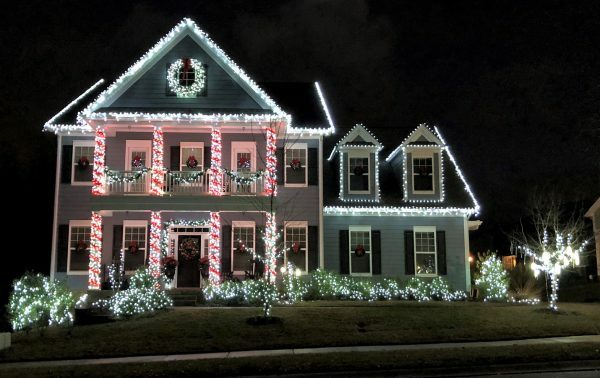 What advice would you give your MB neighbors regarding holiday decorating? For me, I don’t expect everyone to take it to the level that I do. I know it’s not normal. It also is certainly not a competition! I would love to see everyone do something even if it’s small. The holidays are a time for family and for memories to be made. Try making decorating a new tradition. Whether it’s putting up some lights, hanging wreaths or just wearing silly Santa hats together. Find something that makes you happy! Anything else you’d like to share with your neighbors? I’m just so grateful to be here and call you all my neighbors! The amount of kindness and friendship we have received since moving here has been overwhelming. My mother, myself and my daughter all truly feel so blessed to be part of this community and can’t wait to grow our roots here and make many more friendships and memories throughout the years! Merry Christmas!